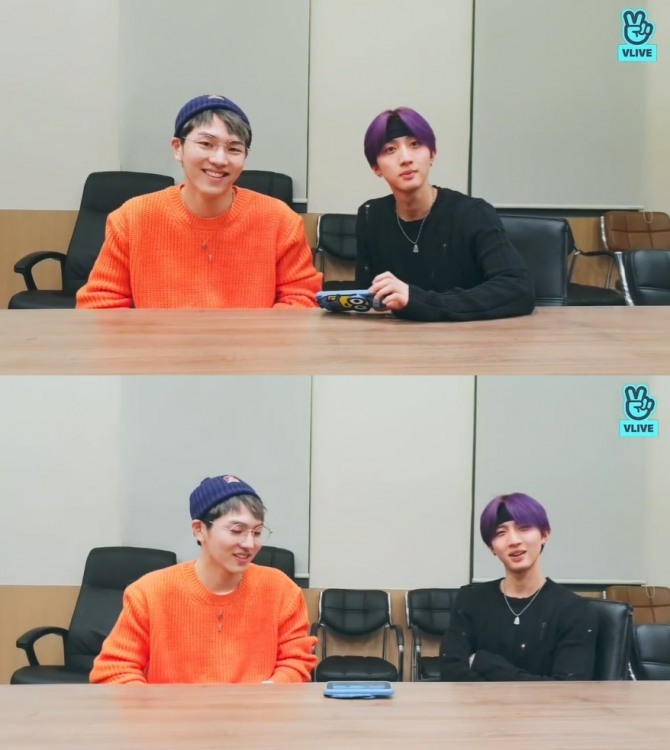 Hui and Kino of the K-pop boy group Pentagon reminisced in a V Live broadcast Thursday about the days before their debut with Cube Entertainment, when they were still in training. The two bandmates recently released a duet titled “The Greatest Wall,” which they composed together and co-wrote the lyrics for. It’s about overcoming hardships to succeed, climbing the greatest wall and “sitting” on it. The music video carries previously unreleased footage from the two artists’ trainee days, including scenes from regular evaluation sessions. “Have you guys all seen the music video for ‘The Greatest Wall?’” asked Kino at the start of the livestream. “We had so much fun, and no pressure at all, making the song. I am glad that many people seemed to like it,” Hui said. He said the video shows a young trainee Kang Hyeong-gu, Kino’s real name, dressed up in his best clothes -- a blue sweater, black pants and two necklaces. “When I think of my trainee days, what comes to my mind first is gimbap,” he continued. Gimbap is a typical takeout food in Korea, made from cooked rice and other ingredients rolled in dried sheets of nori seaweed and cut in bite-sized slices. Kino recalled a defective microphone from the recording studio that the trainees shared. “Yeah. We had to hold it still because there was some part or something inside running loose that made clicking sounds when shaken,” added Hui with a laugh. Watch the duo’s broadcast at https://www.vlive.tv/video/109392. Girl group Twice aired a V Live broadcast on Thursday while waiting for fans to arrive for a photo shoot. “This was a fan event planned in April when the album ‘What Is Love’ came out. Sorry for doing it only now,” said Jihyo. “We will be here until 9 p.m., so those of you who are still coming, come quickly,” she said. The band members were seated in the first row with the center seat reserved for a fan, while those in the second row were standing as if it were a typical family photo. While waiting, the band members spent time making jokes and playing with V Live’s animation functions. “Twice is good at doing V Live broadcasts. Expect more fun livestreams from us this year!” Nayeon said near the end of the 16-minute broadcast. Watch the clip at https://www.vlive.tv/video/109390. The 39-second clip, uploaded to the act’s official V Live channel on Thursday, consists of two scenes. The first shows a bed and a tall lamp standing next to it on the beach. Joshua, one of the band’s 13 members, appears and sits on the bed. In the second, all 13 sit around in an unlit living room. The lights are turned on one by one and the bandmates raise their heads to look at the camera. “Home,” composed by Woozi, Bumzu and Seungkwan with lyrics by Woozi and Bumzu, is among the six tracks on the upcoming record, set to drop Jan. 21. 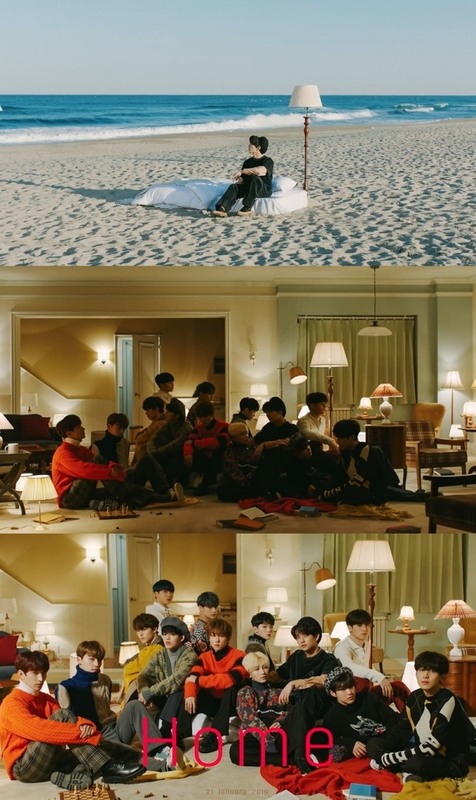 Watch the teaser at https://www.vlive.tv/video/109409.